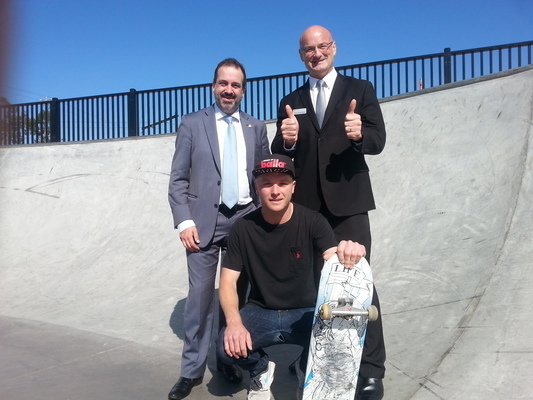 A SKATE park touted as “changing the face of Noble Park” is set for security and amenity upgrades. Skaters across Melbourne have en masse carved their boards through Ross Reserve skate park’s street course, bowl and ramp under bright white lights since it opened several months ago. On 19 October, the reserve received a further $245,000 State funding injection for bright LED lighting outside the nearby community centre and footpaths, earthworks to improve sightlines, and a kiosk near the skate park. Greater Dandenong Council, as part of its $451,000 contribution, will build toilets and shelters for the park’s precinct, and lights for the skate facility’s car park. The works are expected to be complete by April 2017. 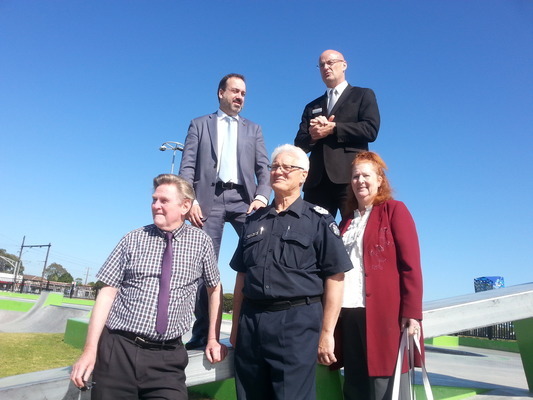 Keysborough MP Martin Pakula said at the funding announcement that the upgrades would help instill community pride and perceived safety at the reserve, and reduce opportunities for crime and anti-social behaviour. 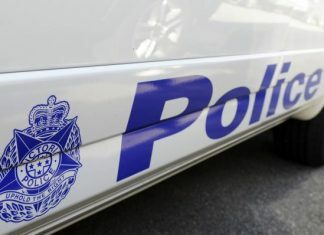 Police and councillors have already observed that the recently opened skate park has been incident-free and looked after by its young patrons. The brightly lit, CCTV monitored arena attracts crowds of skaters at night. Their strong numbers, in itself, improves “passive surveillance”. Cheltenham skater Jesse Donald told the Journal the park’s popularity came down to its variety of rides. He said improved security would attract even greater hordes of young users. Councillors Peter Brown and Roz Blades said the facility had “changed the face of the suburb” and helped turn Noble Park into a “destination” – together with its restaurants and award-winning aquatic centre. Cr Blades noted how young people had cared for the skate park, which seems free of litter and graffiti. Mayor Sean O’Reilly said the council’s Ross Reserve masterplan and impending Heatherton Road rail-and-road grade separation would provide a further boost.